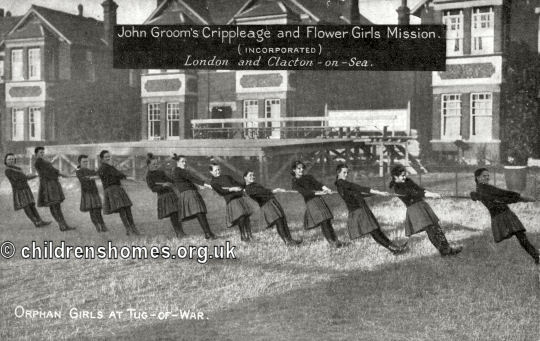 In 1890, John Groom's Crippleage and Flower Girls' Mission, based at Clerkenwell, opened a new branch at Clacton-on-Sea for fatherless girls aged from 2 to 14 who suffered from physical infirmity of blindness. It was also intended to provide a seaside holiday venue for the flower girls from the London Mission. 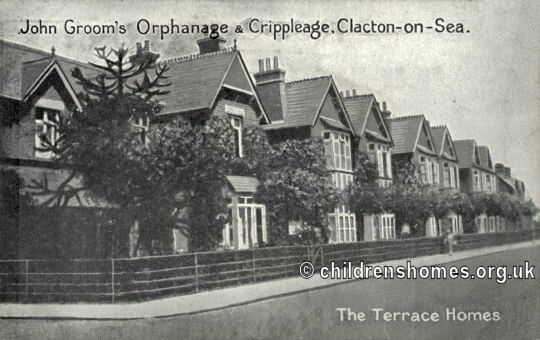 The new home, known as the Orphanage, was initially based in a row three pairs of 'cottage homes' at the west side of Old Road, Clacton. Each of the homes was named after a flower. The layout of the home in around 1897 is shown on the map below. 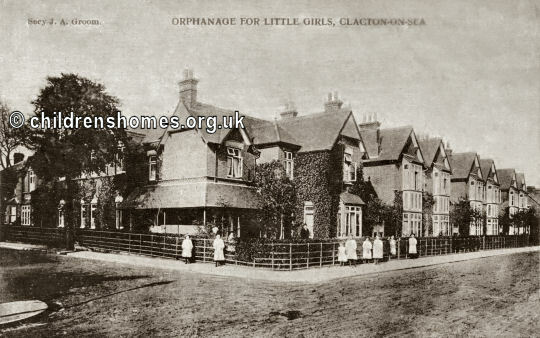 John Groom's Orphanage site, Clacton on Sea, c.1897. A further row of cottage homes was subsequently built at the opposite side of Old Road, set back from the road to provide a central green for the home. The total capacity of the home was then 250 places. The layout of the site is shown on the 1927 map below. 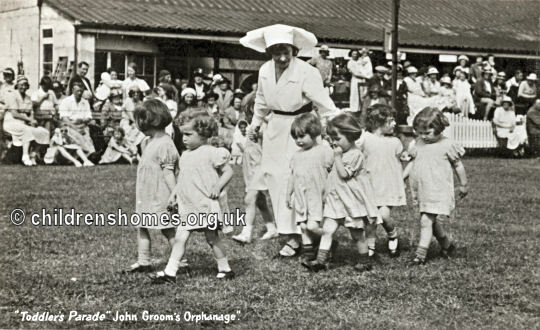 John Groom's Orphanage site, Clacton on Sea, c.1927. Amongst the new houses was an open-air sanatorium. <. The girls attended local schools. On reaching the age of fourteen, they either entered domestic service or were transferred to the flower-making enterprise at Clerkenwell. Tug-of-War seems to have been a popular activity, with the home apparently having its own competitive team. An occasional and very necessary activity, especially for girls with physical impairment, was fire-drill as depicted in the 'artistically enhanced' picture below. 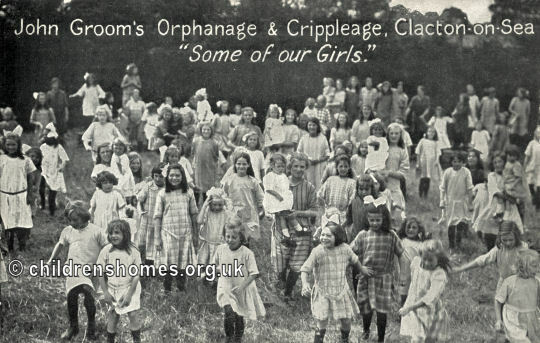 During the Second World War, the older children at Clacton were evacuated to Davenport House, Shropshire. The babies were initially moved to Edgware and were then transferred to Farncote House, Wolverhampton. 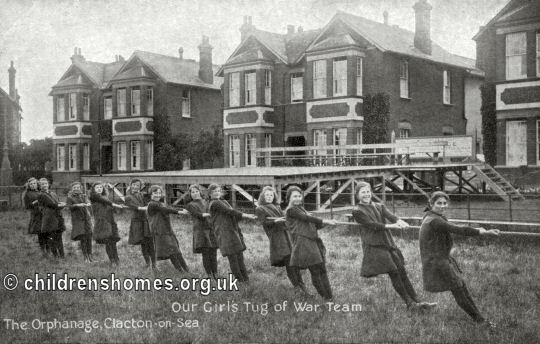 The Clacton home was not re-opened after the war. 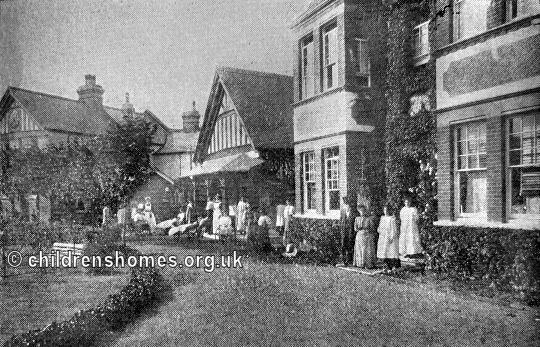 Instead, the babies moved to the new Cudham Hall, near Sevenoaks, and the older children took up residence in a new home in the same area, Pilgrim House. 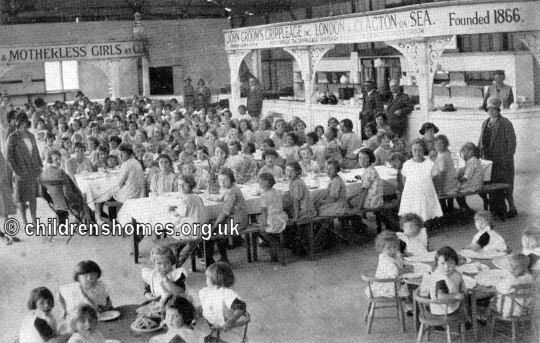 In 1951, a children's convalescent home at Stamford Hill House, Thorpe Bay, Essex, was taken over to become the Thorpe Bay Children's Home. 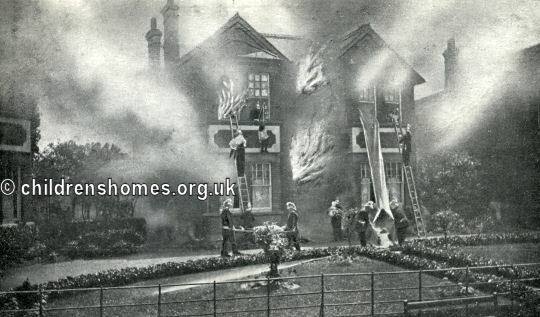 Five years later, the charity acquired Charnwood, near Chislehurst, for use as a family-group home for 12 children. Following a decline in the demand for residential places, the charity ended its work with children in 1979. In 2007, John Groom's merged with the Shaftesbury Society to form Livability, now said to be the UK's largest Christian disability charity. 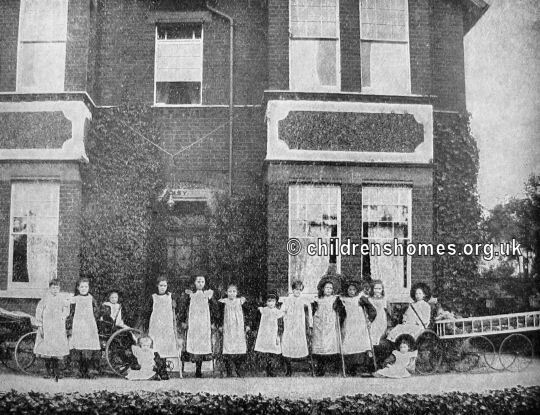 In 1947, the Clacton Orphanage site was taken over by Barnardo's and re-opened as their 'Deal' children's home. The home closed in 1969. The former Orphanage buildings no longer exist and modern housing now occupies the site. London Metropolitan Archives, 40 Northampton Road, London EC1R OHB. (The Ancestry website also has LMA records relating to workhouses and other institutions — more details.) Holds the charity's surviving administrative records.